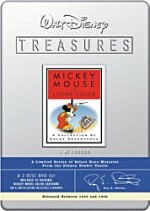 Walt Disney was a true visionary and his most far-reaching vision examined the future. During the 1950s his investigation into space exploration and the wondrous opportunities and challenges of space travel not only came alive in several Disneyland TV shows, but helped create strong public support for the United Stated space program. Go back in time to the beginning of the future and enjoy four episodes and a theatrical short that delve into the mysteries of the universe of space travel - Man In Space, Man And The Moon, Mars and Beyond, Eyes in Outer Space and Our Friend that Atom. You'll also get a rare look at Walt's last film Epcot, in which he reveals his concepts and plans for the Disney World and EPCOT projects. Other not-to-be-missed features include a special interview with noted futurist and author Ray Bradbury. Back when space flight was a burgeoning dream and the future seemed relentlessly exciting, Disneyland’s Tomorrowland depicted a fantastic view of those elements. The master of multiple forms of marketing, Walt Disney explored those issues elsewhere as well, and this two-DVD package entitled Walt Disney’s Tomorrowland gives us a glimpse of some Disney materials created to look at the future in a variety of ways. Most of these appeared on the Disneyland TV program. That series split into subjects related to the theme park’s different lands. For example, “Frontierland” launched the very popular Davy Crockett program. 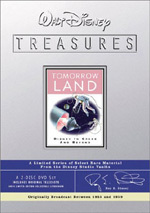 Naturally, “Tomorrowland” focused on futuristic subjects, and this DVD includes a number of looks at the topic. 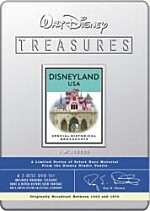 DVD One includes three Disneyland episodes. Aired March 9, 1955, the very first “Tomorrowland” program was called “Man In Space” (49 minutes, 21 seconds). As the title implies, it looks at prospects for manned space travel. Narrated by director Ward Kimball, we get information from rocket scientists Dr. Willie Ley and Dr. Wernher von Braun plus medical expert Dr. Heinz Haber. We learn about the history and development of the rocket, how rockets function, space medicine and the challenges of this travel on humans, and training and equipment. The program concludes with an animated vision of how space launches and travel will work. If there’s some reason to watch “Space” other than for historical curiosity, I can’t discern it. To be sure, this show is cool to see from that point of view. It gives us a good glimpse of the era’s science and concepts. Unfortunately, that doesn’t make it entertaining. Indeed, even the Disney attempts to lighten the dense science with goofy cartoons fail to make “Space” stimulating. Next we get “Man and the Moon” (52:46) from December 28, 1955. Also led by Ward Kimball, this one examines prospects for travel to the Moon. In addition to Kimball’s comments, we find notes from von Braun. It covers historical viewpoints, myths and popular notions connected to the Moon, effects caused by the Moon and its composition, plans for trips to the Moon and the methods that would have to be used for that purpose. The show concludes with a dramatized depiction of a Moon flight. Compared to “Space”, this program comes across as a bit more entertaining. That mainly stems from the creative animation created to illustrate all the historical connections to the Moon; those elements offer a fun synopsis. Unfortunately, once we get into the scientific speculation of the Fifties, things go downhill. As with “Space”, these bits are moderately interesting as a glimpse of the era’s concepts, but they don’t offer anything more than that. It doesn’t help that the scientists got so much wrong. DVD One’s final installment, “Mars and Beyond” (52:40) aired December 4, 1957. It takes on the concept of life and conditions on other planets. Mostly we hear narration, but we also get comments from astronomer Dr. EC Slipher. “Mars” begins with another historical approach, as it views the way societies interpreted stars and other planets through the millennia. These elements include both scientific theories and fictional speculation. From there it looks at the Earth’s creation and development, conditions on other planets, and those with the possibility to maintain life. We progress through prior concepts about Mars and then-current research. The show finishes with ideas of what life on Mars may be like and possibilities for future exploration. Perhaps because “Mars” presents its material more as broad speculation than science fact, it becomes the most entertaining of DVD One’s three shows. It offers a concise little history of astronomy through the years, and we also find a nice look at various conditions and concepts. As with the prior shows, it collapses somewhat when it looks at the travel components, but these play a less important role here. A lot of animation turns up as well. These elements make “Mars” the most winning program to date. As we shift to DVD Two, we locate a theatrical release called Eyes in Outer Space (26:39). Originally released in June 1959, the film looks at the use of satellites. Directed by Kimball, the “science-factual” flick starts with a look at the impact of weather and attempts to predict it as well as factors that cause various conditions. Eventually it gets to a discussion of satellites and lets us know their use in weather prediction as well as future possibilities. ”Eyes” clearly ages better than any of the shows on DVD One. That’s because so much of it deals with elements that haven’t changed. After all, weather still forms in the same ways, and methods of prediction haven’t changed radically. More timeless “Eyes” may be, but that doesn’t make it more entertaining. It falls firmly into the “educational” category, and while it does its job well, it’s not a lot of fun to see. For the second program, we get another TV piece called “Our Friend the Atom” (49:45). Aired January 23, 1957, “Atom” comes hosted by Dr. Heinz Haber. As with its predecessors, history opens the pieces, as the show looks at theories related to atoms through the ages as well as developing uses. It then goes through an explanation of how atoms work and then examines nuclear energy. The first Tomorrowland program in this set that doesn’t involve space in some way, “Atom” proves surprisingly enjoyable. Of course, it definitely focuses on education, but it does so in a brisk and entertaining way. It explains its material nicely and proves useful. Lastly, we find a TV episode entitled “EPCOT” (24:27). Created in 1966 just a couple of months prior to Disney’s death, we hear a little about Disneyland before Walt launches into a discussion of the Disney World project. He relates some details for its planned development with an emphasis on the EPCOT division. Of course, very little of this came to fruition, and that’s part of what makes this show so fascinating; if the plans took place, we’d already know all of the material as reality. Since most of it didn’t occur, “EPCOT” presents a very intriguing look at Disney’s original vision. It’s easily the best program on this DVD. Walt Disney’s Tomorrowland appears in an aspect ratio of 1.33:1 on these single-sided, double-layered DVDs; due to those dimensions, the image has not been enhanced for 16X9 televisions. While the Disneyland USA programs showed a lot of variety among its programs, Tomorrowland seemed more consistent. For the most part, the shows demonstrated reasonable definition. In general, they appeared a little soft, usually due to problems with the live-action footage. The animated sections tended to be sharper and better delineated. No real issues with jagged edges or shimmering popped up, and only some light edge enhancement was apparent. As one might expect, source flaws created a mix of distractions. Again, the live-action material suffered from the highest levels of defects. These seemed fairly grainy, and they also demonstrated moderate levels of specks and marks. The animated portions of the shows tended to appear cleaner. They still offered a mix of flaws, but not with the frequency or severity of the live-action segments. Colors also varied dependent on the format. The animation usually looked pretty bright and vibrant, at least within the constraints of the pieces’ goals. Live-action material tended to appear moderately muddy and messy. Skin tones particularly were heavy, and the live-action bits lacked vivacity and accuracy. Blacks were fine, however, as they showed decent delineation, while the occasional low-light shot came across as somewhat thick but not badly so. The mix of highs and lows meant that I felt the overall package merited a “C+”. While not anything special, the monaural audio of Disneyland USA seemed more consistent than the visuals. Dialogue appeared consistently intelligible and fairly distinct, but speech could sound somewhat thin and brittle. Some edginess appeared. Similar tones affected music and effects, which showed some shrillness and minor distortion, and they lacked much depth or distinction. The audio seemed acceptable considering the source, but it still was pretty bland. Tomorrowland doesn’t pack many extras, but what we get is interesting. We start on DVD One with a 79-second introduction from film critic/historian Leonard Maltin. He provides an overview for the set. Maltin also introduces each of the three programs on DVD One, as he adds basic notes about what we’ll see and also how they fit into a historical context. The snippets go between 103 seconds and 112 seconds for a total of five minutes, 25 seconds. The other supplements appear on DVD Two. First up is another introduction from Maltin. This 50-second piece functions in a manner similar to that of its Disc One companion. More Maltin intros show up for all three of this platter’s programs. These last between 67 seconds and 124 seconds for a total of four minutes, 36 seconds. A new clip called The Optimistic Futurist provides an interview with author Ray Bradbury. It lasts 24 minutes and 40 seconds as Maltin chats with the science fiction legend. They discuss Bradbury’s history with Walt, the popularity of science fiction in the Fifties, his appreciation for Disney’s take on things, his view of the subject and the “Tomorrowland” shows’ impact on the public, his work with Disney and thoughts about EPCOT. Since Bradbury didn’t have that great a connection to the Disney studio, his remarks don’t seem terrifically useful, but the author adds some nice perspective about the sci-fi of the past and his view on Disney. Marty Sklar, Walt and EPCOT fills 26 minutes and 33 seconds. In it, Maltin chats with Sklar, the vice chairman and principle creative executive of Disney Imagineering. Conception of Tomorrowland, comparisons of Walt’s vision of the future with others, the gradual development of Tomorrowland, the creation of the various TV programs, work on the 1964 World’s Fair, topics related to EPCOT, and Walt’s continuing influence. Sklar goes over a lot of subjects connected to the Tomorrowland theme and offers many good notes on them. This is a good interview that suffers only from being too brief; I’d like to hear even more detail from Sklar. The set concludes with three Galleries. These break down into “Publicity and Publications” (15 stills), “Behind the Scenes” (18), and “Story and Background Art” (115). These add up to a good collection of material. Presented in thumbnail batches, some of these also include commentary from Maltin. 30 of the frames include his notes about the shows and other elements. 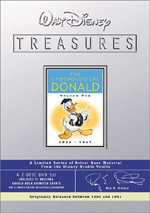 Finally, the DVD’s booklet includes a short text overview from Maltin as well as some archival images. An insert card also displays a reproduction of the poster for the “Space Station X-1” attraction at that used to exist at Disneyland. When the Disneyland episodes related to Tomorrowland aired in the Fifties, I’m sure they offered a tantalizing look at the outer reaches of then-modern science and the future. Viewed almost half a century later, however, the shows stand as historical curiosities and little more than that. The DVDs display erratic but acceptable picture with average audio and a few interesting supplements. I enjoy all things Disney enough to allow me to enjoy Tomorrowland, but I can’t imagine I’ll want to watch these shows again. They’re cool to see for archival reasons; they simply lack much entertainment value beyond that.